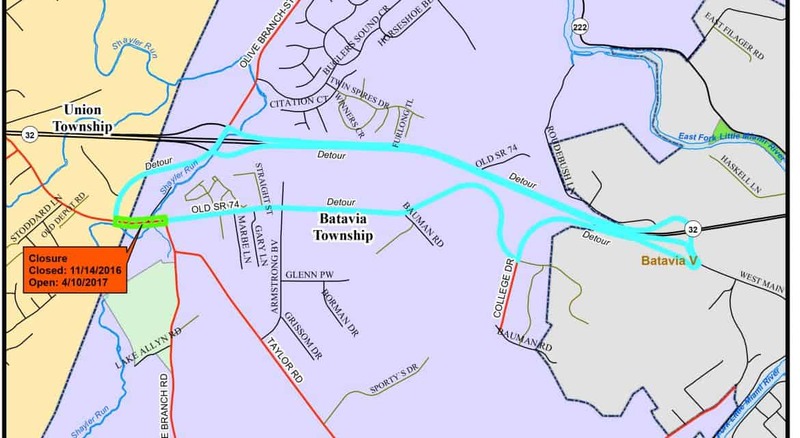 BATAVIA (Nov. 7, 2016) — The Clermont County Engineer’s Office has announced that work to improve the safety and flow of traffic on a portion of Old SR 74 between Olive Branch-Stonelick Road and Armstrong Boulevard will begin later this month. The first phase of this construction project will require a road closure on Old SR 74 between Olive Branch-Stonelick Road and Amelia-Olive Branch Road to widen the bridge on Old SR 74. This closure will begin on Monday, Nov. 14, 2016, and continue through Monday, April 10, 2017, weather permitting. A detour will be put into place and signage will mark the detour route within the project area. The project also includes widening shoulders on each side of the road, as well as adding new curbs and gutters, drainage systems, and sidewalks. The project will also include the installation of new signals with improved sensor technology at the Olive Branch-Stonelick and Amelia-Olive Branch intersections. Construction will begin this month and continue through the winter as weather allows. Significant activity will resume in the spring of 2017, and the project is expected to be completed by the fall of 2017. WHAT: A portion of Old SR 74 will be widened to include a center turn lane, additional width will be added to the shoulders on each side of the road, new curbs and gutters will be built, new drainage systems will be put into place, and new sidewalks will be built along the roadway. New traffic signals with improved sensor technology will also be installed. TRAFFIC IMPACTS: Old SR 74 between Olive Branch-Stonelick Road and Amelia-Olive Branch Road will be closed for widening of the bridge on Old SR 74. A detour will be put into place and signage will mark the detour route within the project area. TIMING: Monday, Nov. 14, 2016, through Monday, April 10, 2017, weather permitting. About the Clermont County Transportation Improvement District: The Clermont County Transportation Improvement District (CCTID) works across geographic and political lines to improve the quality of life for Clermont County residents by stimulating economic development through regional transportation improvements. The five-member board is made up of representatives from the Clermont County Engineer’s Office, the City of Milford, Miami and Union Townships, and the private sector. The CCTID is currently working on nearly two dozen roadway improvements that will increase safety, support better traffic flow through the area, and provide the infrastructure for continued economic development throughout the county. More information about the CCTID and their project work can be found on-line at GoClermont.org.